Four Newark City Council members say they will fight the appointment of a new member to the governing body. Chaos erupted after Tuesday night's vote to select Shanique Davis Speight. Mayor Cory Booker made an unprecedented appearance at the council meeting and cast the deciding vote that put Speight on the council over John Sharpe James, the son of former mayor Sharpe James. Residents rushed the dais and police used pepper spray to restore order. Some residents chanted "Cory's gotta go!" 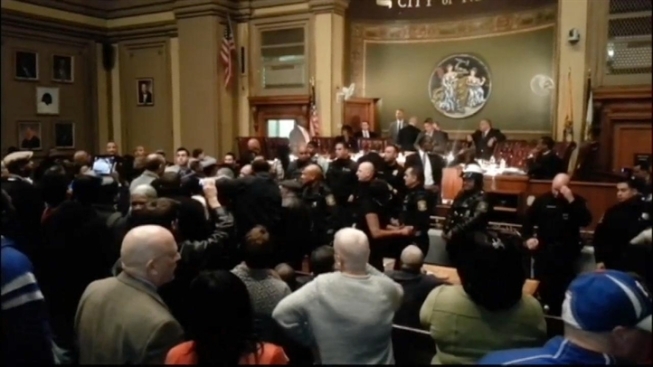 Tensions rose as police escorted Speight to take the oath of office. She was soon ushered out of the meeting room and sworn in by the city clerk. Booker says the matter was handled legally and appropriately. But the four council members say they'll challenge the move in court, though they acknowledged it might be difficult for them to obtain counsel.